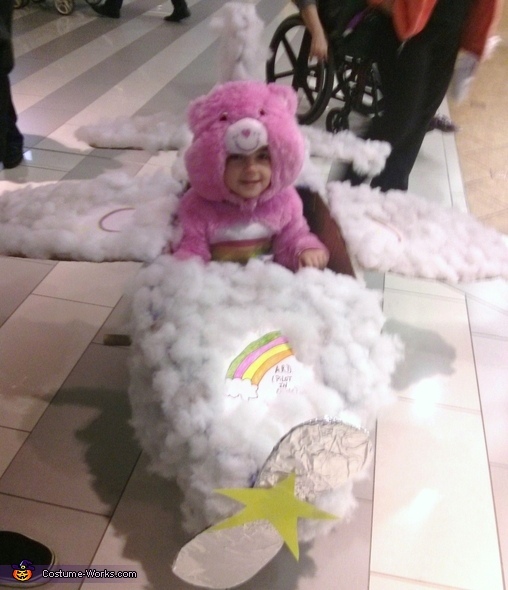 My 3 year old daughter Annabella wanted to be a care bear for Halloween, but she also loves planes. We cannot afford to put her on a real one so we came up with the idea of making her one she could ride. She was cheer bear riding a cloud plane from care-alot. We actually took her to the mall to ride it. We made the plane from cardboard and fiberfill and put her tricycle underneath so she was able to have control of it to move around. We had alot of people staring and taking pictures. The best part was putting a smile on her face and others.